WOKING have been paired with Premier League giants Watford in the Third Round Proper of The Emirates FA Cup. 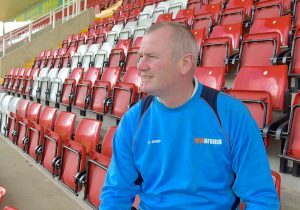 After years away from the media spotlight, football fever will again hit the town of Woking when Alan Dowson’s National League South side host an all-star Hornets team next month. Speaking to the News & Mail on Tuesday, an ecstatic Dowson said: “It’s an unbelievable draw. To have the opportunity to host a top 10 Premier League side at home is something that dreams are made of. When asked if he would have rather have played The Hornets at Vicarage Road, Dowson confirmed that, irrespective of who Woking pulled out of the hat, he wanted a home tie. While cup ties could be switched to the opposition’s ground in favour of generating extra revenue, FA rules now only permit a change of venue now if the home team’s ground is deemed to be unsuitable for safety and security reasons, which is unlikely to apply to Woking. “I know some people would probably have liked the match to be at Watford, but we want to be able to play in front of our own fans and enjoy the occasion,” explained Dowson. “It’s more about uniting the local community and putting the club and the town of Woking on the map again. “I’ve been in football management for over 12 years and opportunities like this don’t come around very often, so it’s a great chance for local people and sponsors alike to get more involved to support their local club,” he remarked. In the meantime, Woking’s board of directors have set up an organising committee to work with the various authorities to establish the permissible ground capacity, FA segregation requirements and ticket allocation. Fans who travelled to watch Woking beat Swindon Town 1-0 last Sunday are advised to retain their ticket stubs as The Cards consider a loyalty ticket booking system.